T/C Barrels & Accessories Sure Fire Black Powder Ammo. 50 Black Powder, 230 GR, Jacketed Hollow Point. Box price, 20 Rounds/Box. 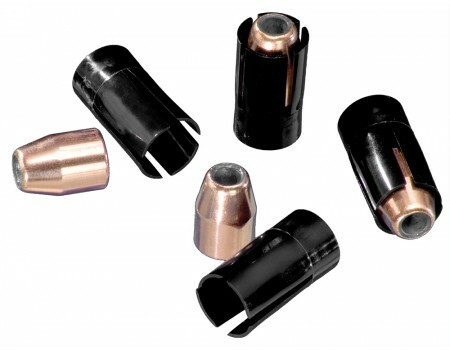 T/C's economic Sure Fire jacketed hollow point bullets provide shooters the same ballistics and trajectory offered by the more premium bullets and Mag Express sabots, at a fraction of the cost. The Mag Express sabots are designed for easy loading, top velocity, and rapid separation from the projectile for less drag of the sabot, resulting in superior accuracy. This model includes 20 each: Mag Express sabots and Sure Fire JHP 50 Caliber, 230 GR bullets.